Managing a social media account can seem a very daunting task; from DMs to hashtags, emojis to gifs, social media has opened up a new wave of communication for individuals and business alike. Knowing how to utilise social media, and tap in to your markets are key to getting your business’ message out there, into the social sphere. Keeping up with the magnitude of postings can also seem an endless task – SocialBakers recommend tweeting at least 3 times a day, posting on Facebook and LinkedIn at least once a day, pinning on Pinterest 4-10 times a day and uploading one photo a day to Instagram. That means you could be posting content up to 16 times a day if it’s appropriate to your business and audience and of course you’ve got the resources to do it. And while frequency is important, timing is key. 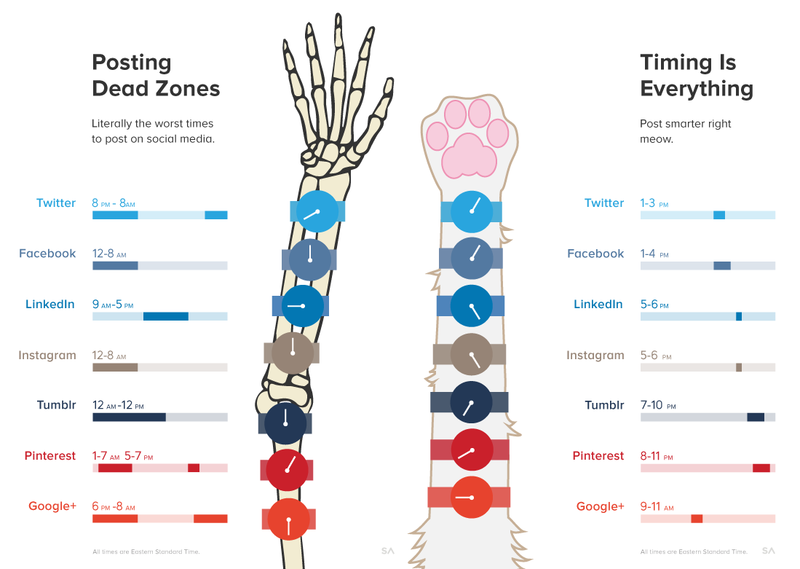 Marketing analytics company SumAll have created an infographic answering just that, detailing social media ‘dead zones’ and peak times to post for engagement. Although this can still look like a lot of man hours, posting at these key times can be done quickly and easily, with the aide of scheduling programmes such as Hootsuite, Buffer, TweetDeck and Social Flow. Scheduling your posts allows you to create a virtual queue of content, geared up and ready to go, right when you need it. You can schedule to a specific day and time (meaning no staying up until 11pm to make the most of Pinterest’s ‘hot zone’) and some social media management systems even offer Google analytics and campaign tracking integration, meaning you can make the most out of your posts. If you’re looking for support in your social media set-up, planning and delivery, the team at Hughes & Co can help – we have the expertise to assist you in getting the most out of social media.